On Guard, November 2018: Support workers in Brazil! Tubeworker — 26/09/2018: Vote Michelle Rodgers! Tubeworker — 26/04/2018: Rejoin Labour and Fight! Tubeworker — 28/03/2018: Housing Is A Right! Tubeworker — 26/02/2018: Roll Back and Resist Universal Credit! Tubeworker — 05/01/2018: Fight the funding cut! Tubeworker — 22/11/2017: Organise against sexual harassment! On Guard, November 2017 - workers can win power! Tubeworker — 26/10/2017: 100 Years Since The Russian Revolution - Workers Can Win Power! Tubeworker — July 2017 – Topple the Tories! Tubeworker — 03/06/2017: Vote Labour, fight for a workers' government! Tubeworker — 24/04/2017: Vote Labour! Tubeworker — 29/03/2017: Defend The London Bridge 3! Tubeworker — 23/02/2017: Protect Migrants' Rights - Hands Off Our Workmates! Tubeworker — 26/01/2017: Prepare To Strike Again! Tubeworker - 29/12/2016: Station and Revenue Staff: All Out on 8-9 January! Tubeworker — 27/10/2016: Solidarity With Refugees And Migrants! Tubeworker - 29/09/2016: Gear Up For Strikes! Tubeworker - 24/08/2016: Make It A "Hot Autumn"! Tubeworker - 27/07/2016: Time For Action! Tubeworker - 05/07/2016: Defend Migrants' Rights! Tubeworker - 25/05/2016: Vote In, Fight For A Workers' Europe! Tubeworker 27/04/2016 - Kick The Tories Out Of City Hall! Tubeworker 23/03/16 - Fight For Disability Equality! Tubeworker 24/02/16 - Support The Junior Doctors! Tubeworker February 2016 Pay/Night Tube Offer Special: Vote No! Tubeworker 29/01/16 - Strike For Your Future! Tubeworker 25/01/16 — Keep The Strikes On! Tubeworker 23/09/15 - Fight For Our Right To Strike! Tubeworker 22/08/15 - Keep The Pressure On! Tubeworker 27/07/15 - Strike Two! Tubeworker 08-09/07/15 (LU Strike Special) - We Can Win! Tubeworker 24/06/15 - The Fight Is On! Tubeworker 28/05/15 - Take On The Tories! Tubeworker 06/05/15 (Special Edition for RMT reps' meeting) - Re-energise the jobs fight! Tubeworker 30/04/15 - British-born and Migrant Workers: Unite! Tubeworker 26/02/15 - The answer to austerity: expropriate the banks! Tubeworker 28/01/15 - Clean up exploitation! Tubeworker 26/11/14 — Vote Eamonn Lynch for RMT Executive! Tubeworker 29/10/14 — Reinstate Vicky, Noel, and Alex! Tubeworker 25/09/14 — Build the ban. Prepare to strike! Tubeworker 30/07/14 — Take action against cuts! Tubeworker 07/05/14 — Strikes have forced concessions: keep up the pressure to win more! Tubeworker 23/04/14 — Strike To Stop Cuts! Tubeworker 02/04/14 — Management Isn't Budging In Talks: Prepare To Strike Again! Tubeworker 26/02/14 — Keep up the fight to save jobs! Tubeworker 10/02/14 — Our strike rocked the bosses! Tubeworker 30/01/14 — All out to save jobs! Tubeworker 15-16/01/14 — This fight belongs to all of us! Tubeworker 04/11/13 — Stop the jobs carnage! Tubeworker 08/08/13 — Fight the 12.5% cut! Tubeworker 29/06/13 — Public transport, not private profit! Tubeworker 31/05/13 — Woolwich murder: fight the racist backlash! Tubeworker 02/05/13 — We're Right To Strike! Tubeworker 07/03/13 - Time to draw lines in the sand... and fight! Tubeworker 05/02/13 — Solidarity with the Athens metro strike! Tubeworker 05/12/12 - Cleaners strike again! Workers' Liberty civil service bulletin for N30 day of action: daring action can win! Tubeworker 03/11/12 - No job cuts! We've collated a few recent items from our blog into a printed bulletin, for distribution at workplaces. Look out for it in a mess room near you! 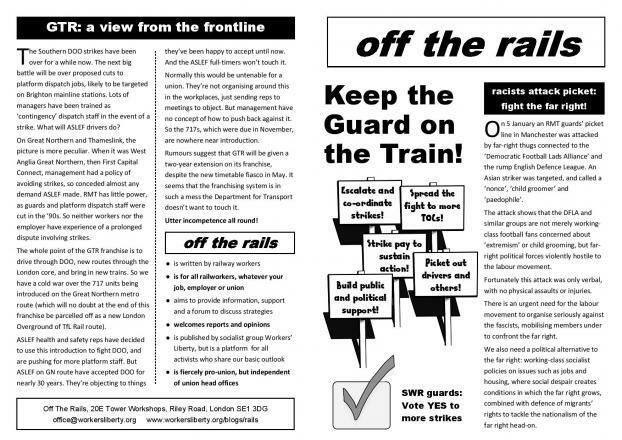 The latest edition of On Guard, a socialist industrial bulletin for Sheffield rail workers, by Sheffield rail workers.